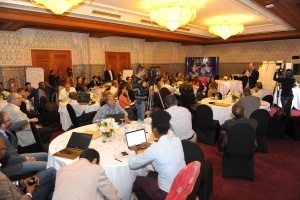 MOROCCO May 10-12: The University Mohammed VI Polytechnic brought together about 65 people from Morocco and other African countries to Marrakech for a three-day event led by Climate Interactive. The audience included business professionals, professors, agronomists, and youth leaders. We began with the World Climate simulation, then spent a day training people to lead World Climate, followed by a third day where we discussed climate smart agriculture and the basis for a new system dynamics model on the topic. This three-day event kicked off our focus on Africa in the run-up to the COP22 climate talks. 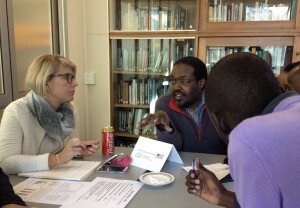 KENYA May 24-27: We held two events in Nairobi. The first, helped to inaugurate the opening of the Kenyan Climate Change Resource Centre and gave Climate Interactive’s newest team members Dr. Grace Mwaura and Juliette Bohland a chance to run the World Climate Simulation. 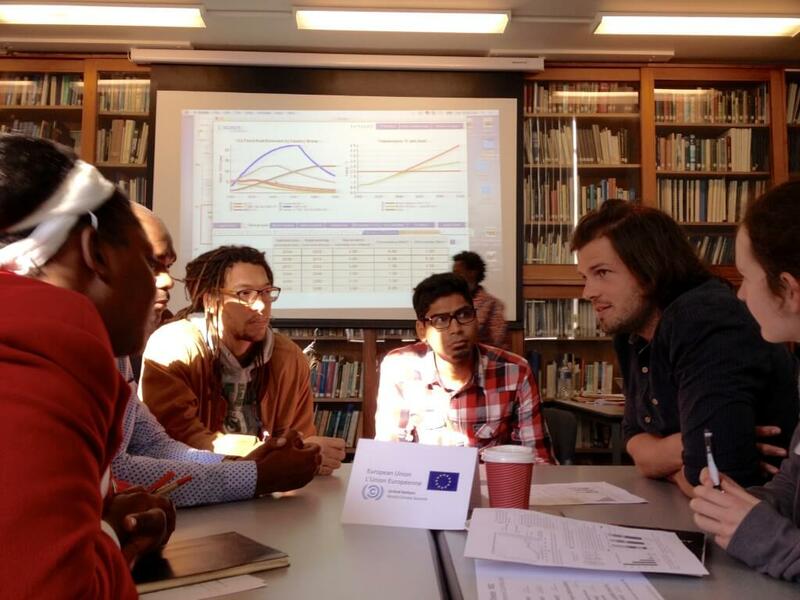 We worked with the Low Emission and Climate Resilient Development Project (LECRD) team to pull off the event. Later that week we ran a two-day event to train people to facilitate the World Climate simulation hosted by KCA University and LIWA, which drew about 20 people. The audience included young people spearheading climate efforts across Kenya to researchers to business leaders. ETHIOPIA May 30-June 1: Our trip to Addis Ababa was short but we packed it with three events. The first was a presentation to the Ethiopian Agricultural Transformation Agency a unique agency looking at the systemic issues around agriculture in Ethiopia. 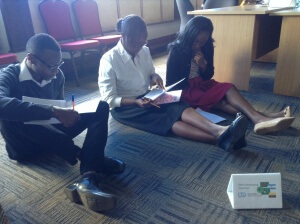 Then in partnership with the African Union’s Early Warning Division and the Institute for Peace and Security Studies (IPSS), we ran the World Climate Simulation for diplomats at the African Union, with a focus on the connections between climate and security. 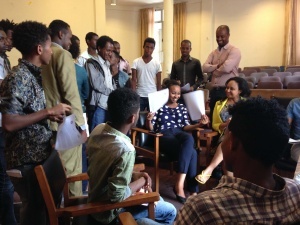 We wrapped up our trip to Addis with a World Climate simulation at Addis Ababa University, which we worked with IPSS on again. The simulation drew mostly students who had varying degrees of familiarity with climate change. SOUTH AFRICA June 7-8: Our first stop in South Africa was at the University of Cape Town where the Department of Environmental and Geographical Science hosted us for a World Climate Simulation. The simulation drew a mix of professors, researchers, graduate students, and outside participants. From there we were on to Stellenbosch University’s Sustainability Institute to run World Climate and offer a training in how to facilitate it. Many of the participants who came had an interest in system dynamics and were curious how Climate Interactive has applied system dynamics to our models on climate change and exercises like World Climate. These events are only the beginning. We are hoping to reach tens of thousands of people ahead of COP22. Last year ahead COP21 people around the world registered events and in total we all reached over 10,000 people. Let’s do that again but really focus on Africa where the next climate talks will be held and where the impacts of climate change are particularly acute. In these travels the last months, I heard many stories about the climate impacts that people are seeing from a man in the Moroccan Ministry of Agriculture talking about the shift Morocco is forced to make to more drought-tolerant crop varieties to late night discussions about the strain that drought could have on Ethiopia’s plans to become carbon neutral in 2030 through the Renaissance Hydropower Dam on a Nile River tributary. Join us and run the World Climate simulation where you are.